Custom designed van and car decals by Mark Hardy at Zetagram in Carracastle, Ballaghaderreen, County Mayo. Free design consultations available. One of the best forms of advertising for local businesses in the west of Ireland, is bold and eye-catching vehicle graphics and van design. Advertises your business 24/7 wherever your vehicle is parked, while driving on the road or stood in traffic. Please Note: Zetagram is not a signwriter, it is a design service that works with signwriters to apply custom vehicle graphics. If you require simple graphics applied to your vehicle with no design input, we are happy to recommend a suitable signwriting service in your area. To view examples of vans, cars and trucks that have been designed by Zetagram, visit our Vehicle & Fleet Graphics page in the Portfolio section. 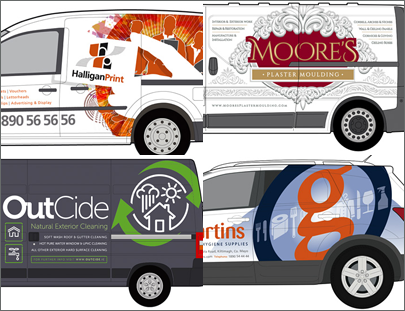 Zetagram has had extensive experience in designing van wraps and liveries for Irish and UK companies for over 20 years. We work closely with our clients to really understand the core of their businesses, their customers and their competitors, and use this to accurately represent their needs and requirements in our designs. The basis of effective vehicle graphics is a good logo and style. If you don't have these already, Zetagram can design you a new logo or alternatively refresh your current logo to bring it up to date. What is the type of vehicle? Whether it is a car, van, truck or plant will make a difference to what design and information we can put on a vehicle. The manufacturer and model, panel sizes, paint condition and colour all make a difference. For example:- Most vans have a large visible area to work with so they can hold a lot of information, but heavy plant does not, so it needs to be smaller and bolder to brand the vehicle. It's a simple thing - do you just want to brand the vehicle so it looks professional, or do you also need it to potentially attract new work? For example:- Most fleet vehicles just need to be branded, plus basic contact details. They are one of many, and only need to be a presence on the road or on location. However, a sole trader or tradesman may need to make more of a statement with their single van, demonstrating a range of services, plus some form of call to action. Each business has different needs. Vehicle & fleet graphics designs can start from €200 and range up to €650. These designs take between 1-2 weeks to develop and can be presented in person as printed visuals or via email as electronic proofs to reduce costs and save time. Prices vary due to the type of vehicle, the colour of the vehicle and the type of design required. For an accurate estimate, contact us with as much information as possible, and email us images of all four sides of the vehicle and we will be happy to give you a price to meet your needs. For more information and to further discuss Zetagram's Vehicle Graphic and Fleet Graphic Design service, why not contact us to arrange a free design consultation at our office in Carracastle, County Mayo.